All installations include materials. 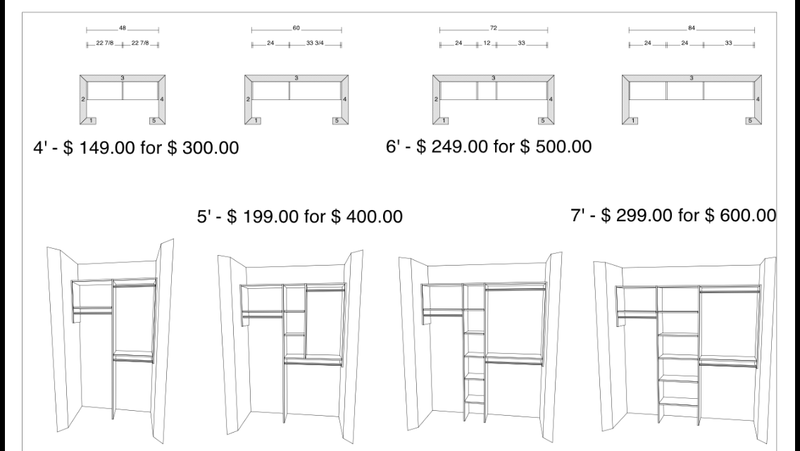 See diagram of closet here. Design can be used for more than just aesthetics; it also can be used to improve the energy flow of a room. Learn how with Groupon’s guide to feng shui. According to Taoist belief, nearly everything radiates an invisible energy, known as chi, that binds both people and objects together. The design concept of feng shui is centered on this concept, and particularly the belief that realigning objects—and their chi—can create a harmonious, balanced living space. As with open-heart surgery, feng shui is all about where things should be. An accent wall, mirror, vase, or piece of furniture in the right spot is thought to promote everything from inner calm to professional success. But where to put things? The first step in any feng-shui project is to analyze the energy of a space. Mapping energy can be somewhat complicated, as it requires a special feng-shui compass called a luopan, but the result is an insight into what a given space—and, by extension, your life—is lacking, whether it be stability in relationships or a sense of focus. Bringing in items that represent one of the five elements (fire, earth, metal, water, and wood) balances out these inefficiencies. For instance, if you’d like to enhance your career, you might break out the red paint to create an accent wall in the south area of your home. This brings in the fire element, which is thought to activate your personal energy and help you achieve recognition. Alternatively, a green houseplant or walnut armoire in the east area of your home brings in the wood element, believed to improve health. But feng shui is about more than just color. Clocks, mirrors, and electronics also play an important role, and depending on where they are placed, they can either block energy or improve its flow. For instance, mirrors never should be hung facing the front door, as they take the energy flowing in and push it out. They also should not reflect your bed or be hung behind your bed as this brings worries into the bedroom, which should be a place of calm and relaxation. Equally important to the feng-shui process is a lack of clutter, good air quality, and a balance of light. Tidying up your space, using an air purifier, opening windows, and installing dimmer switches are all ways to improve the energy of your space. Promotional value expires 120 days after purchase. Amount paid never expires. All services must be redeemed during a single visit by same household. You must call to schedule installation. Merchant cancellation policy of 48 hours applies; voucher may be subject to forfeiture. Colors available for this promotion: Almond, Antique, Black, Grey, Maple. Other color options available for an additional cost. Please call 267-888-6680 for more details. Includes all materials, 12 inch deep materials and installation. May also apply value of voucher to a larger job. New customers only but merchant agrees to honor all Appointment required. Valid only within 30 miles of zip code 19116. Subject to availability. Limit 1 per household. Merchant is solely responsible to purchasers for the care and quality of the advertised goods and services.